Another landscape improvement that we usually recommend to our clients is the addition of landscape lighting. 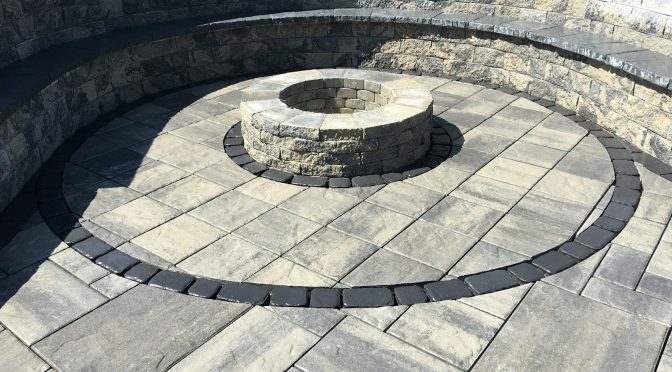 At Brick by Brick Pavers and Landscaping, we have landscape artists and technicians who can help you decide on what type of lighting to choose and where it should be installed in your landscape. We provide professional installation services anywhere in New Jersey. Down lighting – Lights are installed high up in trees to cast broad illumination over a wide area. This is best used in outdoor living areas and recommended if you want to improve the security in your property. Silhouetting – The lighting fixtures are placed behind a focal point or structure to emphasize its outline. Cross Lighting – This lighting technique intends to create a three-dimensional effect on a specific design or structure in a landscape. Niche lighting. Various landscape lighting fixtures are used to illuminate outdoor living spaces, like gazebos, barbecue areas, and sheds. Diffused lighting. This is used to provide evenly spread illumination for plants, shrubbery, and other ground covers. It can also be installed underwater to add drama to a garden pond. Grazing – This lighting technique is used to highlight the texture of an object, like the bark of a tree, wood shingles, masonry walls, or the intricate designs of entry doors. At Brick by Brick Pavers and Landscaping, we are updated with the latest trends in landscape lighting. That’s why we can easily meet the demands and preferences of our clients. For New Jersey clients who want to use green technology, just let us know. We can install LED and solar lighting in your property. LED lighting consumes much lesser energy but can still provide the same brightness compared to traditional lighting. It lasts longer, much safer, and available in various designs. If you want to save more, we can recommend solar lighting. This kind of lighting fixture can last for years without the need for replacement or repair. Solar lights can also be installed in a set-and-forget manner because of sensors that are usually attached to the unit. Our aim is to always provide complete satisfaction to our clients. When you let us handle the design and installation of the landscape lighting, we ensure that only certified technicians are sent to your area to perform the installation. We see to it that appropriate tools and equipment are used during the installation process to ensure the safety of personnel and homeowners. The lighting fixtures are also carefully selected from the leading manufacturers in the country. And, lastly, we do not use substandard lighting products.